I recently wrote about life being overwhelming and how I'm coping. Today, things seem more dire than ever. As I write this, I'm sitting next to an extremely ill family member and preparing myself for the worst. I've already ugly cried twice in the last few hours and probably will have several more ugly cries before the day (weekend, week) is out. But, I also have a son to think about. Even though my son is 18, he's still my baby. His brain is still developing, and all of his hormones are still all over the place. Overall, he's a normal 18 year old in most regards. I feel so lucky to have the son I have. Like any other 18 year old, he's forgetful. He's more into his MMOG--massively multiplayer online game--than chores. He'd rather talk about The Walking Dead or Breaking Bad than school or a job. He's concerned that his hair parts in the right spot and how he looks in his jeans. He loves Campbell's Chunky Soup, Doritos, and Hot Pockets, but he'll eat fruit and veggies if I put them in front of him. He loves our dogs and where we live. He loves his family and his friends. He's smart. He doesn't party or sneak around. Other than forgetting his chores, he's super responsible and dependable. I have a good kid. He's a good egg. But, we are struggling with grief. I started going to a therapist a few months ago to deal with my multiple responsibilities and a health issue of my own, but now it's time for my son to talk to a therapist too. We're both close to facing some major changes in our lives due to our family member's health crisis, even if that family member pulls through and comes home. Which brings me to the point of this post...how do you parent through grief? My natural inclination is to hole up, alone, at home, and to block out everyone and everything, but I'm a mom. I can't ignore life. There is absolutely no shame in seeing a therapist, a shrink, a counselor--sometimes the pressure of what life brings is just too much to bear alone. I needed a safe, judgment free place to talk about what I'm going through and to get unbiased input in how to deal with it all. Sometimes just talking it out is enough, but at other times my therapist has given me exercises to work on or specific tasks to take care of. Even if the sessions are sometimes really hard, they always help. I've been to counseling before, and if you are considering going, please know that sometimes the first few sessions make you feel worse before you feel better--keep going! Also, if you don't like the first person you see, try someone else. You need to have a good fit with your therapist in order for counseling to be effective. If you don't have insurance or think you can't afford counseling, ask about sliding scales, fee forgiveness, and payment plans. Years ago, when I was in an abusive relationship and had virtually no disposable income, I was able to pay a mere $5 per session thanks to a sliding scale. Some churches and organizations even provide counseling for free. Just as there is no shame in seeing a therapist, there is also no shame in taking an antidepressant or anti-anxiety medication. I was on antidepressants for two years when my son was a toddler. I was overwhelmed with a bad relationship, trying to be a good mom, and trying to finish my undergraduate education. I stayed on those meds until right before I left our abuser. I would not have gotten through that period of life without the support of medication, a primary care doctor that was incredibly supportive, and a good therapist. Today, I saw my current primary care provider, a nurse practitioner, and got a prescription for an antidepressant. My emotions and thought processes are all over the place due to stress related to ill family members and emergencies, work, parenting, my financial situation, and more. I needed help...I'm hoping the medication will help smooth out the edges and reduce the emotional roller coaster of emotions to gentle speed bumps. I don't want to be numb to life, but I want to be clear enough to handle everything. I am thankful that I have a strong network of friends and family--many friends who are so close that they are like family--and so does my ill relative. I was able to ugly cry in the arms of one friend and she and her husband were extremely helpful in facilitating a meeting with a doctor and to articulate my relative's wishes clearly when I was at a loss for words. They also have been wonderful at intercepting contact between other friends and concerned acquaintances in order to give me some space to focus on the situation at hand. We are lucky in that our friends and extended family are willing to pitch in and help with my son too. A neighbor can take him to the grocery store and already often brings him soup and other homemade treats that he loves--even when we don't have a crisis happening! Friends, neighbors, and relatives fill in the gaps. I cried in the shower last night, and I pulled over my car and ugly cried in a parking lot. Getting out those overwhelming emotions while alone allowed me to pull myself together to focus and get through the hours ahead before the next wave of emotions. I have to admit that I've had two very large coffees today and I have a Coca Cola in my bag as I type this. It was tempting to stop at McDonalds or to guy buy junk food, but I made a better choice and bought a small package of almonds and filled my water bottle with actual water. In an hour or so, I plan to go to the hospital cafeteria and get some fruit, veggies, and protein. And, this evening, and again tomorrow morning, I will take my son and our dogs for a long walk. Exercise, even just walking, gets the positive endorphins going. I don't expect exercise or nutrition to make me perky and happy--all sunshine and rainbows--but it will help give my son and I a little boost. Walks together also give us time to get out of the house and outside of our own heads. And, occasionally, a walk opens up communication and we talk about deeper topics and what's going on in each of our hearts. I anticipate a long road ahead for both my son and I. And, I anticipate that life will get worse before it gets better. Grief is a process though and even after all the unknowns around our family member's situation are resolved it could be a while before life goes back to normal. If you are facing similar challenges, remember to be kind to yourself and focus on what you can control. Eat well, exercise even if only a short walk, and lean into your friends and support network. Go to counseling. Talk to your primary care doctor about what's going in your life. Consider medication--but only if you know you can take it safely and carefully. And, if you are so overwhelmed that you are having dark or dangerous thoughts, get help immediately. Call your doctor's office. If you are thinking of hurting yourself or others, go to the Emergency Department for immediate help or call a suicide prevention hotline at 1-800-273-8255. Take care of yourself so that you are able to take care of your family. Sometimes, it's ok to put yourself first. 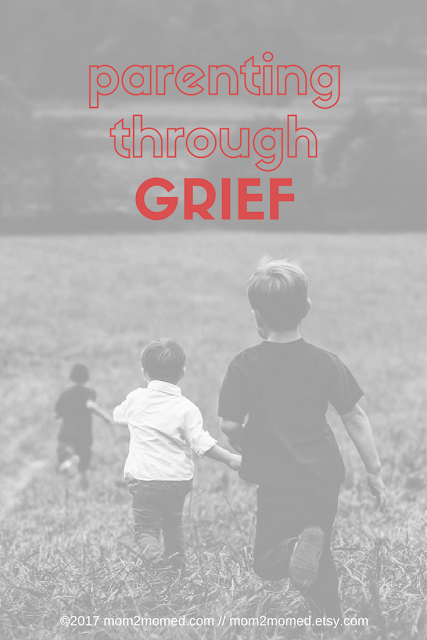 And, if you have any good tips on coping with grief while parenting, please leave a comment.